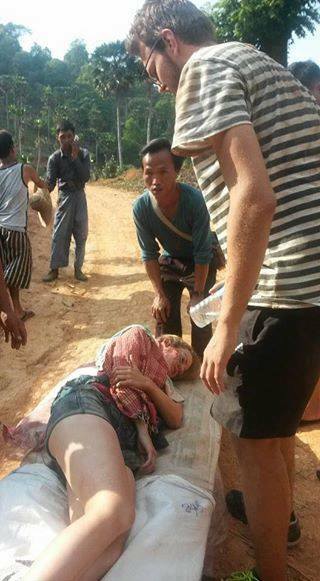 Three people were wounded when a landmine exploded as they were sightseeing in Northern Burma on Tuesday 26 April. The three people were two German tourists and their local guide. The area where the explosion took place is close to where the Burma Army is fighting with an ethnic Shan armed group. AFP reported that the three injured people were treated at a hospital in Mandalay – the local guide suffered shrapnel wounds to his legs, and the two tourists for a head and upper body injuries. A 2015 report by the Landmine and Cluster Munition Monitor stated that Burma is still heavily mined as a result of more than 60 years of armed conflict. The worker said that it will take years to make the state safe. A survey conducted in 2014 by the aid delivery organization, The Border Consortium, of security concerns in 222 villages in southeastern Burma, found that 53% were affected by landmines. Surveys conducted by the Royal Thai Army estimate that the Thai Burma border is the region’s most heavily landmined. Fighting between the Burma Army, the Restoration Council for Shan State (RCSS) and the Ta’ang National Liberation Army (TNLA) Shan has seen thousands of villagers displaced in recent months.